Portable ergonomics on the go! 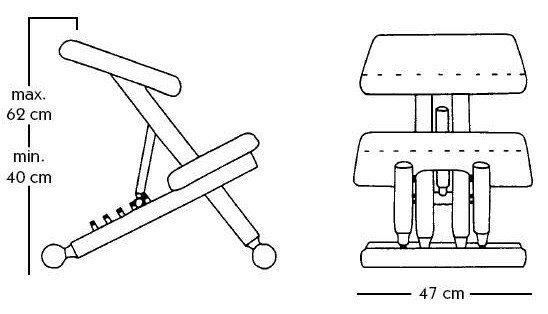 Kneeling chair folds flat for portability and storage. 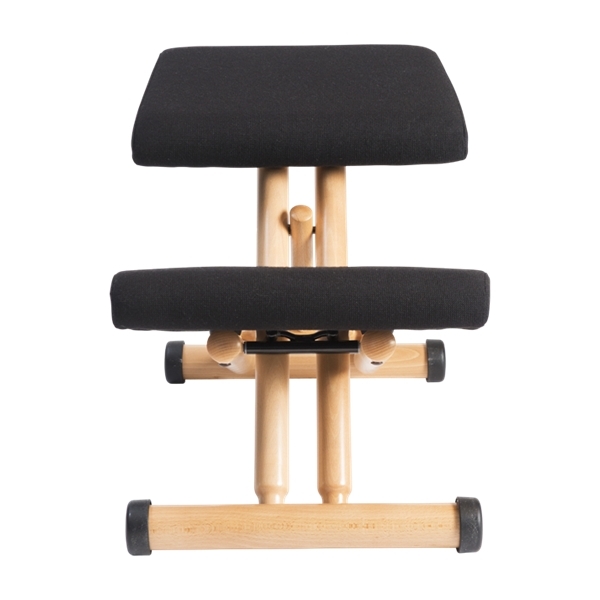 A portable kneeling chair by Peter Opsvik. 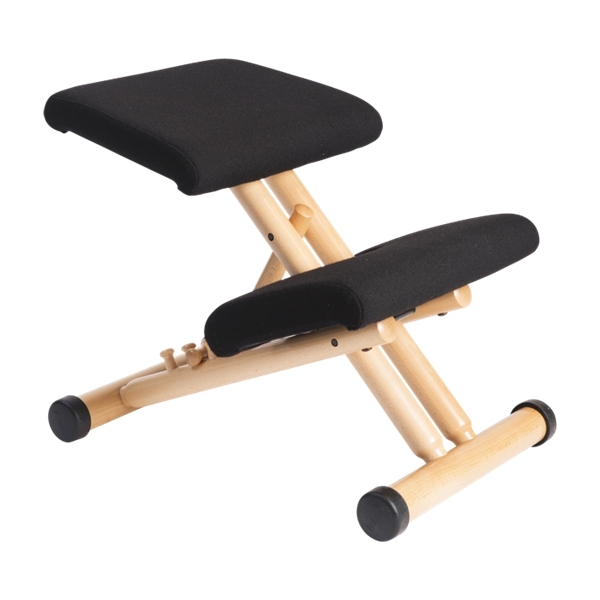 The Multi Balans kneeling chair has an adjustable design suitable for portability. 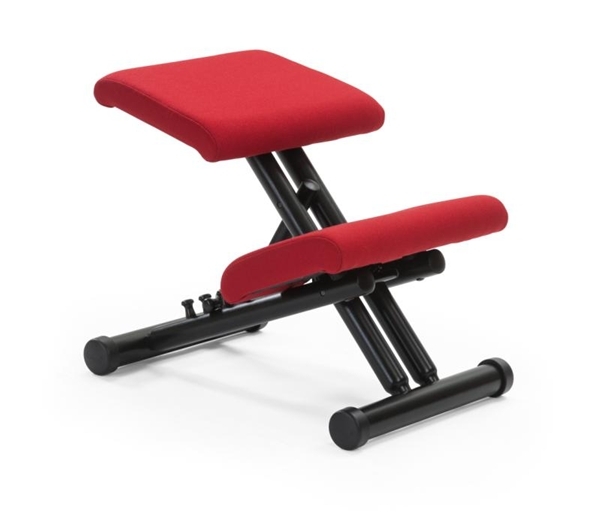 The forward-slope of the seat adjusts simultaneously with seat height, At its highest point, the Multi Balans helps relieve back strain and pressure by enhancing a neutral upright posture similar to the spine curvature when standing. 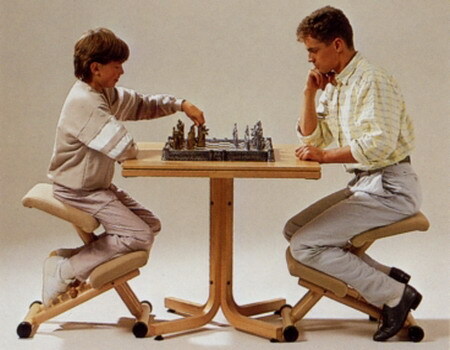 At its lowest point, the chair can be used by a child as a chair or desk. The chair folds for easy transport between workstations or locations. When not in use, the kneeling chair can be hung on the wall with the optional hanger, making this a good solution for small spaces such as dorm rooms or compact workstations. Adjustable seat height and angle. 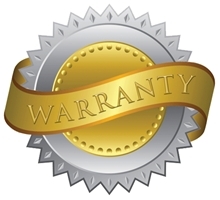 Wheels allow easy rolling forward and backward. European beech wood frame is strong, lightweight, and durable. Wood is harvested from sustainably farmed sources. Handcrafted by skilled Norwegian artisans. 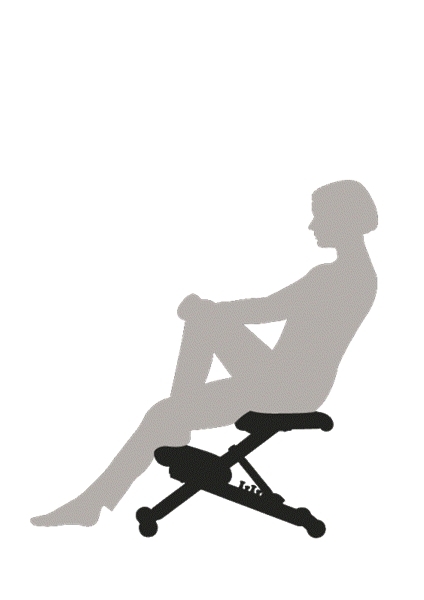 Seat height 17.32" - 24.41"
The forward-slope of the seat adjusts simultaneously with seat height. This is a drawback from an ergonomic perspective. 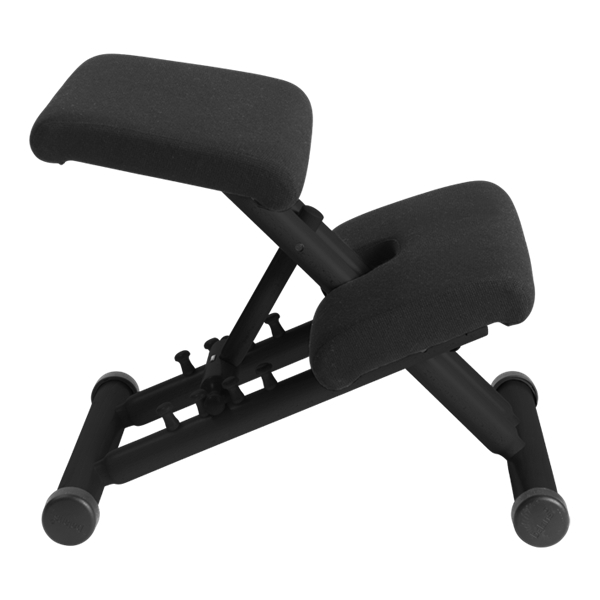 At the highest adjustment seat angle tilts forward. This opens the angle between upper body and thighs to help relieve back strain and pressure by enhancing a neutral upright posture. 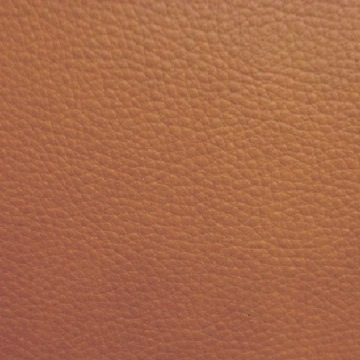 At the lowest adjustment the seat is flat. 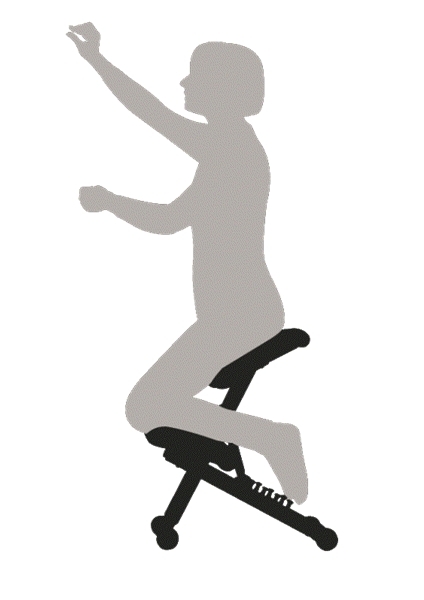 Thus the seat can no longer align with the thigh and can no longer facilitate an upright posture. 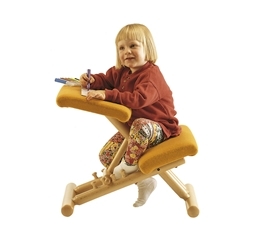 A better use at this height is for a small child, who would sit on the knee pad in the reverse direction and use the seat pad as a desk. There are different ways of sitting in the chair - toes touching the floor or not, one leg out, one leg in, so a limited amount of postural variety is possible. If you need greater postural variety, check out the Variable Balans or the Thatsit Balans. Another negative is that the wheels only allow movement forward and backward. There is no swivel and the wheels cannot roll to the side, so it doesn't spin and it's not good for rolling around or fumbling through the office drawers around your desk. Fits both children and adults from about 4'10" to 5'7". We do not recommend the Multi Balans for those over 5'8", those with very long legs, or those with big feet. For these individuals there may not be enough room for the legs or feet, forcing the knees to bend further than is comfortable. 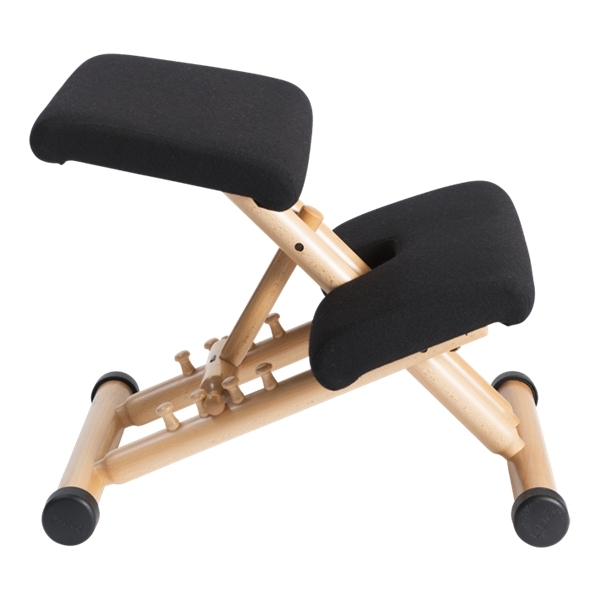 Use of the Multi Balans kneeling chair requires a minimum 130° knee flexion range of motion (bending of the knee). This is well within the normal range of motion for a healthy knee, but those with knee pathology may have lost this freedom of motion. A knee forced to bend beyond its available range of motion could cause harm.